Our pets aren't just animals, they're members of our family with an attitude & personality all their own. Whether it be cheering us up after a hard day at work or keeping watch over us while we're sick, our pets love us. Caring for our furry friends is something we all do. Whether getting them a special treat, waking at the crack of dawn to take them for a walk or paying extra for a special shampoo, you always go the extra mile to love your pets. 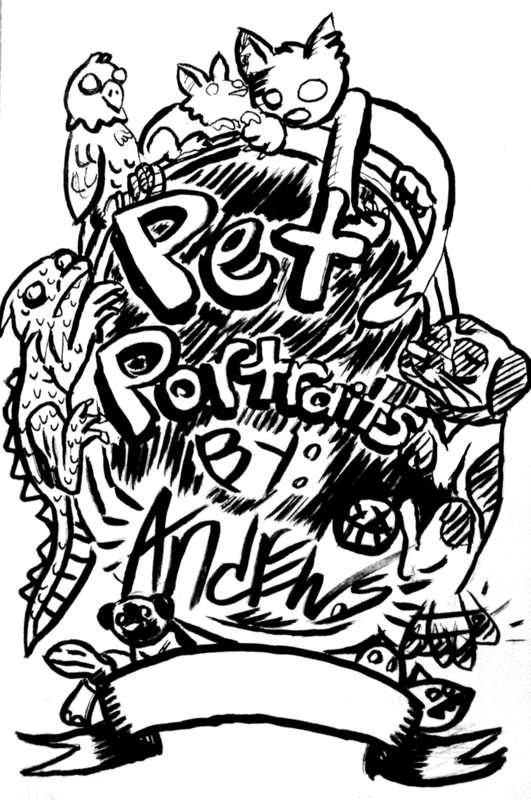 Pet portraits by Andrew are one of the most personal ways of paying tribute to your furry friend. By capturing their essence in a collectible piece of art, you will be able to display not only all the beauty of your pet, but their personality as well. A Personal sized pet portraits is a high quality acrylic painting of your pet done on an 9x12, pre-stretched canvas. This is something that is completed over the course of several days. The finished work will come ready to hang with care instructions. Perfect for pet owners on a budget! Get a beautiful, black & white ink illustration of your precious friend for only $45, and get it ornately water colored for only an additional $15!! 11x17 ink pieces start at $65, and 9x12 pieces start at $45. Perfect for bigger furry families, this piece automatically comes with two free pets, and if you believe your pets are extra adorable, I'll include another two pets for free! This is an extra large, ornate version of the Original Pet Portrait Package, and on a staggering 16x20 sized canvas, this piece is more than worth the extra cost. Don't have multiple pets? Get a painting of you and your pet together, or your animal in the millennium falcon! Get whatever you want! The sky's the limit with this one!! After you submit your pet portrait request, I'll send you a paypal invoice & get on top of finishing your piece once payment has been processed!! Orders can be hand delivered or shipped, depending on what you want. Include what you'd like to see in your portrait, what size of piece you want, information about your pet & some links to pictures of them! If you have any questions or comments, definitely write those, too! *To easily attach pictures of your pet, go to imgur.com, click the green "new post" button at the top of the page, upload a picture of your pet, click "copy" next to the image link on the right of the page & paste it into your message to me!